The history of the Austerlitz scroll is a microcosm of the history of the Jews over the generations. The scroll was originally commissioned in 1822 by Joseph Behr Heshke and Chaele Cahrr in honor of the Bar Mitzvah of their son, Mordechai. 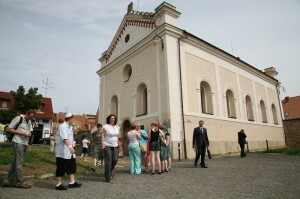 Austerlitz is in the province of Moravia, which is today in the Czech Republic. Austerlitz at that time was a thriving Jewish Community, one of many which was to be decimated during the Holocaust. During the Nazi occupation of Czechoslovakia, many Jewish sacred religious artifacts were collected and shipped to Prague. After the war, the collection came under the control of the Czechoslovakian government and was housed in the Jewish Museum in Prague. There were 1564 Torah Scrolls which were purchased 17 years later by a London businessman and sent to Westminster Synagogue in England. The scrolls were examined and repaired so that they might live again in synagogues throughout the world. Five of those scrolls were from the community of Austerlitz. Siegi Isakson, a concentration camp survivor and then Houston resident, went to London in the late 1960’s to bring one of the scrolls to Houston. The scroll was kept in an ark in his home until the founding of Congregation Beth Am. Siegi was one of the founding members and as such donated the scroll to the synagogue as its first Torah. 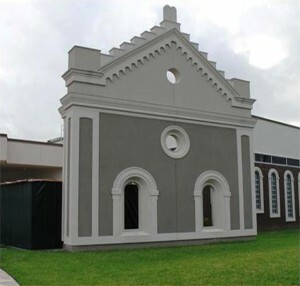 With the merger of Congregation Or Hadash and Congregation Beth Am, the newly named Congregation Or Ami became the proud heir to this unique piece of Jewish history. Our Austerlitz wall honors our connection with this lost community. To learn more about the history and journey of other Torah Scrolls and Jewish artifacts that were saved, please visit the Memorial Scrolls Trust website at memorialscrollstrust.org.